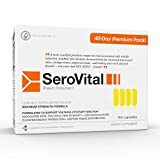 Serovital review 2018 : Is it still the number #1 HGH anti-aging supplement? Serovital-hGH is a very popular anti-aging hgh supplement meant to be taken by both men and women. HGH supplements for anti aging are getting increasingly popular, however like the majority of products out there, Serovital is also primarily a blend of amino acids. Although amino acids have been clinically proven to enhance hgh production in the body, this enhancing effect is quite minimal and doesn’t last long, because of the body’s homeostasis system. Overall, Serovital is a reasonably effective anti-aging supplement, with mixed reviews. Is Serovital really the perfect HgH product? Should you order a free trial from myserovital.com. Continue reading in order to discover why we changed our opinion on Serovital. Serovital is a well-known name – We see it pop up on almost every corner …even celebrities have been talking about it. Awhile back, Dr. Oz was on television discussing San Medica’s HGH study(the company behind Serovital). Ever since he mentioned it, people throughout the world have been talking about Serovital. Serovital was originally designed in order to replace expensive prescription anti-aging injections – primarily the growth hormone therapy, it can increase HGH levels by a large percentage – 692 percent, to be exact. However there are still many facts behind the study. But despite all of the chatter nesting behind Serovital, does it really deserve the reputation it’s getting right now? What ingredients does it consist of? Are you familiar with amino acids? Well, Serovital contains may of them. The amino acids in Serovital, just like other HGH supplements out there, have been specifically chosen to increase the production of HGH and to stimulate the pituitary gland. However, amino acids are just one piece of the puzzle and their efficiency is drastically reduced if not combined with other ingredients like choline supplements. We discuss that in this comprehensive guide on HGH. L-Lysine – This is an ingredient that can be used in order to boost protein production and immunity. Many athletes are using it in order to naturally enhance their “growth hormone.” Research has revealed that when arginine is combined with lysine and it is taken by mouth, it stimulated both insulin and pituitary somatotropin (HGH) release. We feel that people need to know about the research that was involved in 1200 mg of both arginine and lysine. However, when we look at Serovital.com, we don’t find any mention of the concentrations with any specific ingredient, so it’s not possible for us to tell whether or not it has this amount of L-Lysine. If we assume that Serovital is like Growth Factor 9, then it is possible that it contains 2.9 grams of all of the ingredients combined – for those of you that don’t know, Growth Factor 9 is from the same company and is another type of HGH based performance booster that uses that same formula and ingredients as Serovital. L-Arginine HCI – This is an amino acid that is needed in order to produce nitric oxide. Nitric acid is a compound that is responsible for increasing blood circulation. According to research, L-arginine helps to increase the resting hormone growth responses. However, Arginine will need to be taken in a doses of 1200 mg if it is combined with L-lysine. There are some studies out there that we found that didn’t demonstrate a release of HGH until the dosage had been increase to 5-9 g of Arginine alone. This amount if almost double the amount that we believe Serovital contains. So the question is – why do people feel the need to take a high oral dose of amino acids in order to produce anti-aging effects? If people need to do this, why do those products like Serovital not contain a lot of amino acids like L-arginine and L-lysine? Oxo-Proline – This is an ingredient that is derived from glutamic acids. Numerous studies have been conducted on animals and they have suggested that Oxo-Proline can cause a decrease in the non-enzymatic antioxidant defenses in the brain and it can cause what is called “reactive species production.” These studies have also suggested that the usage of oxo-proline can result in protein oxidation. So, if we gather all of our facts here, we find that oxo-proline has some horrible effects on the body. Long story short, when you take Oxo-proline, it can “draw out oxidative stress” or ruin the body’s capabilities of restoring damaged cells. Oxo-proline is known for releasing toxic effects by producing free radical. So, with those thoughts in mind, it could damage lipids, DNA and proteins. It can even speed up the signs of aging, which is definitely not something you want, especially if you’re looking for a good anti-aging product. N-Acetyl L Cysteine – This works as a powerful antioxidant that attaches to the free radicals and while it’s attached, it neutralizes them. Afterwards, a mixture of glutathione is promoted. If you’re not aware, this is a stable form of Cysteine, which can be transformed into cysteine in the cell. N-Acetyl L Cysteine could be helpful for counteracting the oxidative effects of oxo-proline, but at this time, there is not enough research being done that could prove any type of impact on the production of HGH. However, when it comes to N-Acetyl L Cysteine, it does have some pretty good anti-oxidant, anti-aging and anti-inflammatory benefits nesting behind it. Men that have used this supplement have found that they have a higher level of testosterone, have more energy and more vigor. So yes, we would like to give a good old “thumbs up” to Serovital for actually including N-Acetyl L Cysteine as well as L-Glutamine in their product. L-Glutamine – this is an amino acid that acts as a buffer when we exercise. It helps to prevent catabolism and soreness of muscle. Research has indicated that HGH can enhance the body’s ability to be able to work harder and longer, so this right here is a good ingredient and we are glad it has been included in Serovital. L-glutamine is also known for being a good “stress buster” due to its ability to handle mental and physical stress. Bodybuilders and athletes throughout the world enjoy this due to the fact that is helps keep the stress hormone (cortisol) in check, without having to deal with side effects and due to the endurance it provides. If you’re like me and you have been looking at “HGH benefits,” then chances are, you already know that HGH is great for “sound sleep” and “stress control.” It can lower stress levels and help with “positive” thinking and well-being. So whether or not you choose to use “Serovital,” in the end, one thing is for sure and that is the fact that you SHOULD take L-glutamine. L-glutamine is a great anti-aging supplement and there aren’t any harmful side effects. Find out more information on HGH supplements containing L-glutamine. HGH anti-aging supplements are gaining a lot of popularity. Overall, Serovital-hgh seems to be a reasonably effective amino acids based HGH enhancer although we would have liked it to include few more hgh enhancing ingredients. How to pick a HGH product and not get scammed. Why HGH- The Health and Fitness Benefits?